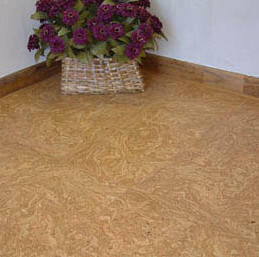 GreenFloors Cork is environmentally correct as well as improving health and comfort for human indoor living. In our homes, cork floors create a warm, comfortable, resilient surface that is gentle underfoot, and is anti-microbial. From harvest to production to installation, cork is environmentally sustainable, non-toxic, and healthy. Cork is a truly sustainable “green-building” material. Trees are grown and the bark is harvested in the centuries old tradition without harming either the trees or their habitat. Bark is initially sent to a factory to create stoppers for wine bottles. 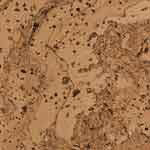 Cork flooring is then created from post-industrial by-product of the bottle-stopper industry. This ‘waste’ material is ground up and then formed into sheets using minimal amounts of adhesive to bind the particles together under high pressure. ALL CORK FLOORING IS SOLD BY THE BOX. Price Per / sq ft $5.50 / $484.00 per box. Length: 12" Width: 12" Height: 3/16"
88 tiles per carton or 88 sq ft.
Price Per / sq ft $5.59 / $93.38 per box. Length: 35" 13/16" Width: 11" 13/16" Height: 1/2"
6 planks per box or 17.6 sq ft. Thanks to the very simple CLIC revolutionary system you can install your own GreenFloors Floating Plank flooring in no time! CLIC uses an ingenious form of tongue & groove to “click” the planks together without the use of glue. Because you don't need glue anymore, CLIC is much easier and cleaner to work with and there is no waiting time, so your floors can be walked on immediately after installation.